It falls to Daniel to defend Sidney, but when an employee of the British embassy in D.C. has been found dead, Daniel grows suspicious about Sidney’s alleged crimes and searches for evidence in what has blown up into an international affair. 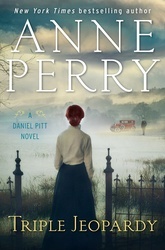 Anne Perry is The New York Times bestselling author of two acclaimed series set in Victorian England: the William Monk novels, including Dark Tide Rising and An Echo of Murder, and the Charlotte and Thomas Pitt novels, including Murder on the Serpentine and Treachery at Lancaster Gate. She is also the author of a new series featuring Thomas and Charlotte Pitt’s son, Daniel, including Triple Jeopardy and Twenty-one Days, as well as five World War I novels, 16 holiday novels, most recently A Christmas Revelation, and a historical novel, The Sheen on the Silk, set in the Ottoman Empire. Anne Perry lives in Los Angeles.